Raksha Bandhan is celebrated every year probably in the month of August preferably during Shravan Purnima and on a full moon day. This festival is celebrated almost in every state of India and the tradition remains the same only the rituals differs. Thus during this festival every individual sparks in joy which is expressed in the form of Rakhis and everyone gets in a mood which is incomparable by nature. On the day of this pious occasion the female members gets up early from bed and take bath. After this they offer prayers to their deities for the well being of their brothers and prepare a Rakhi pooja thali which contains a diya, roli, chawal, Sandalwood paste, Sweets. The sisters carry these thalis after worshipping Lord Ganesha starting with Aarti followed by applying tilak on the forehead of the brothers. After this ritual the sisters take the blessings of their brothers and in return give them gifts which are one of the most lovable presents. Every year Raksha Bandhan is celebrated all across the world with lots of caring touch which signifies a perfect bonding between two siblings. The gifts giving ritual was not in vogue during the earlier times but nowadays they have become popular and this gives a glimpse of soothing touch. This exotic Raksha Bandhan occasion is very pious and this gives an exuberant feeling within the minds of the family members. This occasion is celebrated all across the world with a great enthusiasm culminated in the form of Rakhis. There are various Rakhis which are sent to the foreign countries and these items are carried with the help of the online companies who does these tasks in a jiffy. The companies are on general basis very punctual and active in doing this delivery tasks therefore nowadays maximum people rely on these online companies as they can work 24x7 without any break. Rakhis are also delivered in several gift forms and are combined with Dry Fruits, Chocolates, Sweets, Perfumes, Apparels, Fruits, Cakes, Idols of Goddess Lakshmi and Ganesh etc. In this year special mention goes for the Exquisite Gift Wrapped Golden Plated German Silver Thali with Dry Fruits, one Free Rakhi, Roli Tilak and Chawal. The weight of the Dry fruits increases from parcel to parcel and these are very common gifts which deserve special attention. This special designer German Silver Thali is all set to attract the attention of the sisters who choose this awesome present for their beloved brothers. This festival is celebrated among all religions and this Rakhi or the sacred thread enhances one message which is the permanent bonding between a brother and sister. Therefore Raksha Bandhan of 2016 would be a mind blowing event where every member of a household participates with great enthusiasm. This festival is also renowned in the foreign countries where there is Indian origin and over there the items which are mandatory for Raksha Bandhan are sent on time. In the modern scenario Rakhis are decorated with precious stones, Kundan, Zari which really makes the item look gorgeous and people from Punjab, Gujarat are fond of these Rakhis. 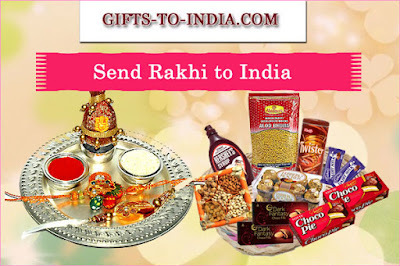 The online companies send Rakhis to the foreign countries like United States, UK, Canada, Toronto and many other countries. The total population in India celebrates Rakhi with splendid fun and togetherness which is totally incomparable to the other festivals. This Raksha Bandhan turn on the rhythm and devote your precious time doing shopping for your brothers who desires for your love. By sending a captivating Rakhi gift would envelope your brother in love and warmth like a soothing sunset. This Raksha Bandhan basically culminates an emotional bond between a brother and sister both of them enjoys with full enthusiasm. This festival is totally embraced by the love bestowed for the siblings who enjoys this day with lots of pleasure and waits for this sweet moment for the last one year. This corking moment is spent by delivering the cherubic delicacies and perky gifts which fills the hearts of every individual. Therefore enjoy this Raksha Bandhan with lots of fun which is unforgettable. With the onset of Shravan month in accordance to the Hindu Calendar Raksha Bandhan arrives with a boom. This pious festival tightens the siblings bonding even if anyone stays far away. In India this festival is celebrated almost in every state following the same tradition according to the Hindu rituals. 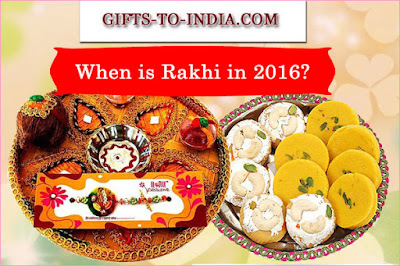 This year that is in 2016 Raksha Bandhan would be celebrated on 18th August resuming to a specified time period. On the day of Raksha Bandhan the sisters rise early from bed and take a bath. After taking bath they worship the deities and offer prayers for the well being of their beloved brothers. Along with the sisters every member of the household rises up early and takes bath and join in the prayer session. Raksha Bandhan is celebrated during Shravan Purnima and on a full moon day which makes this festival more pious by nature. The customs which are followed during this festival depends from state to state and religion to religion. Rakhi or Raksha Bnadhan is famous in North and East India, Avani Avittam in South India, Pavitropana in Gujarat, Nariyal Purnima in Maharashtra, Goa, Karnataka and Kajari Purnima in Chattisgarh, Jharkhand. The customs which are followed during Raksha Bandhan starts from worshipping of Gods after which Aarti happens when the sisters prepare a Rakhi Pooja Thali with different Sweets, Roli, Chawal, Diya, folowed by Tilak which is made of Sandalwood paste and after this brothers give their sisters memorable presents. This season join in the celebration of Raksha Bandhan with awesome fun and frolic which makes the sisters happy. In earlier times the tradition of presenting gifts was not in vogue but in the recent times this has become a trend where the sisters pray for the long life of their brothers and the brothers give presents to make this event a remembrance. Sometimes it also happens that the Rakhis are sent to far off countries through the various courier companies who do this task more easily and systematically. Rakhis are of various types like Swastik Rakhis, Rudraksh Rakhis, Beads Rakhis, Stone Rakhis, Coin Rakhis, Lumba Rakhis, Peacock Rakhis, Zari Rakhis, Zardosi Rakhis, Bracelet Rakhis, Om Rakhis, Cartoon Rakhis, Chocolate Rakhis, Pearl Rakhis, Dry Fruits Rakhis, Kundan Rakhis and many more. This festival is celebrated in almost every household in India with great enthusiasm and this moment is enjoyed among every member of a particular family. Therefore Raksha Bandhan is not a festival of brother and sister but even the mother, wife can also tie a Rakhi on the wrist of a male. This festival is enjoyed by people who belong to any religion despite being a Muslim, Christian, Jain, Sikh etc and even they enjoy in this splendid season. Raksha Bandhan is a splendid festival which not only invites the children but even the adults also plays an active role. Festival of brotherhood best expressed in the form of Rakhis which are tied on the wrists of the brothers for their well being. This exotic item is a heart throb of many and that is the reason why Rakhis are the most sensational products in the Raksha Bandhan festival. This festival enlightens each and everyone who loves to be in the company of the dear ones and spend time in the midst of happiness. This moment is unforgettable in the life of every brother and sister who waits for this day from one year back. This glorious day brings some happy moments which is only expressed from the eyes of the individuals. 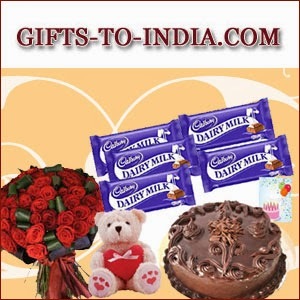 Before the onset of Raksha Bandhan the gift shops, market places, different online stores are crowded with people especially the females as they get involved in this season of togetherness. Raksha Bandhan paves the way to deliver enormous joy which comes from beneath the hearts of every individual who loves to deliver utmost fun and frolic. Along with the Rakhis there are Dry Fruits, Cakes, Chocolates, Apparels, Soft Toys, Sweets, Precious Stones, Corals, Cookies, Fruits, Flowers, Mugs and many other items. Thus Raksha Bandhan solely brings happiness in the lives of majority of people who loves to get indulged in the midst of this sensational festival. This festival sparks happiness in the lives of the people who love to enjoy by deliverig these precious gifts which makes a remarkable memory in the life of the sisters. The inspiring Hindi expression of “Raksha Bandhan” manifests the “The Tie to Protect” (“Raksha” means “To Protect/Protection” and “Bandhan” means “Tie”). This Raksha Bandhan is a much famed socio-religious festival of India and within the Indian community worldwide. This is a heartening observance which inherently praises the intrinsic auspicious connection between a brother and a sister. This is a one-of-a-kind celebration by which the combined traits of sanctity and joyousness drench the core of every Indian Bhai (Brother) endowed with a Behen (Sister) and every Indian Behen gifted with a Bhai. Arriving every year in the middle of the month of August, the gala of Raksha Bandhan is performed through divine practices and social customs by each pair of Hindu sister and brother linked to one anoother by siblinghood’s pure tissues. The principle holy protocol of this observance is that of the sister bedecking the right pulse of her brother with a colourful silken honoured by Hindus as the Rakhi string. Indian sisters, whether a N.R.I or a local one, make the year-long wait with all the excitement for the fete of “Raksha Bandhan” to come and let them implement their finest endeavors to fully abide by the clerical traditions of the day of the fete, so that the Brother-Sister Bond gets lauded in the most wholesome way. By tying an ecstatic Rakhi cord also known as the Raksha Sutra on her brother’s right wrist, a sister seeks from God a happy and healthy life for her brother. Her brother, reciprocally, gives her his earnest commitment to be there for her in her all ups and all downs. The Raksha Sutra essentially enhances the natural tie of promises and safeguarding that thrives between a bro-sis duet. The relation between a Bhai and Behen is a singular one. Nurtured with emotions of endearment, anger, sharing, quarrelling, fondness and companionship, this bond stands afront from all other human bonds with its exclusivity. Henceforth it can be said that to glorify all the more the chastity of this unique man-woman connection, the Hindu community-a clan believing in the indispensable importance of human relations, dedicataes one whole day for recognizing religiously this exquisite opposite gender fraternal bond. Through this observance, the features of traditionalism and culture, inherent to the land of India, gets heightened up to a heartening extent. As clocks in the gala of “Raksha Bandhan” every Indian sister, older or junior, becomes all geared up to pick up the most splendid Rakhi thread for her endeared brother. Shopping for the best Raksha Sutra is the fundamental preparation every Behena ensures to make during the time of “Raksha Bandhan”. Stores and shopping malls get decked up with a widecollection of variant Rakhi strings of enticing designs and greeting colours as the festival slowly makes its way into the lives and hearts of Indian bro-sis duos. In the modern times, the online shopping stores also offer a diverse range of Raksha Sutra of comely patterns and fetching hues for workaholic, occupied and distanced sisters, not having time to visit markets, to elect and bestow to their brothers on the pious day of “Rakhi Purnima” [the full-moon day when the fete gets held]. The e-commerce technology has indeed made it possible for a Behen staying in foreign lands to redress her agony of missing the observation of “Raksha Bandhan” with her dear brother, by aiding her in choosing the most fitting Raksha Sutra and delivering that to her Bhai in India, in a much convenient endeavor. From the e-stores sisters can shop exotic Rakhi cords like Designer Rakhi, Pearl Rakhi, Zardosi Rakhi, Lumba Rakhi for Bhabhi, Kids Rakhi, Fancy Rakhi, Bracelet Rakhi, Swastik Rakhi, OM Rakhi and similar Rakhis to send to their Brothers in India. These virtual shopping stores also present cheering Rakhi tokens and joyful Rakhi combos for a sis to buy and deliver to the doors of her bro on the day of “Rakhi Purnima”. 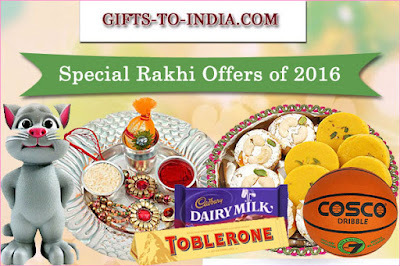 The e-shopping zones feature inviting Rakhi Hampers such as Rakhi with Sweets, Rakhi with Dryfruits, Good Luck Gifts, Rakhi with Pooja Thali, Rakhi with Chocolates, Rakhi with Toys, Rakhi with Greeting Cards, Rakhi with Cake, Rakhi with Fresh Fruits, Rakhi with Flowers and much more of such resembling gifting options for sisters to pick and gratify the souls of their brothers. Hence, if work or any compulsion compels you to be geographically separated from your brother on this “Raksha Bandhan”, don’t stay depressed and visit the web stores offering Raksha Bandhan special tokens and deliver your elected souvenir of heartiness to your bro, residing in India, which transmits your adoration for him and reverence for this relation.